Identical promo as 2011, and more surprisingly, the same price a well! Back in June, on the night before my wedding, my friends and I ventured out to find a McDonald's so I could do some reviews, and so they could give some local items a try, as neither of them have been to Thailand before. You may have read my review for the Samurai Pork Burger which I did, and that was from the same night. Like the Pork Burger, these pies were also something I've had at least once before, but I had never reviewed them properly. Though the Tuna Pie is a promotional item, I had it once before, back in 2011 and reviewed briefly here. After the first time I tried it, I never thought I'd willingly order it again I hated it so much, but since I wanted my friends to try the horribleness that I thought it was, we did order it. To my surprise it was a little different than I remembered. First, it was about 1/3 larger, so it was roughly the same size as the rest of the pies, this also gave us enough to break it into 3 pieces to split amongst ourselves. Also, the tuna filling was actually looked and smelt like tuna, rather than being a white mostly mayo paste. When taking a bite you could now definitely think it as being indeed a 'tuna' pie, as it tasted exactly like canned tuna, it still didn't work well with the fried pie crust, but it definitely wasn't as terrible as I remembered. The other two pies, the Pineapple, and Corn Pies are the standard menu pies in Thailand. I've had them twice before, once the first time during my first trip to Thailand in 2006, and once again in 2010, as I didn't have photos of my first time. I never got around to reviewing them, so this was a perfect opportunity to try them one more time. The Pineapple Pie was near identical to the one I had in Malaysia earlier this year, but I think it may have had larger chunks of pineapple inside, my friend from Canada quite enjoyed it. The Corn Pie was creamier than I remembered it being, but it was also much more tasty too. 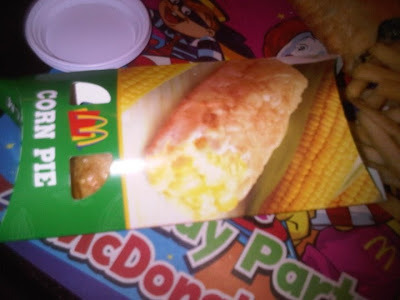 A puree of corn wouldn't work, so this creamed corn filling was as good as it could be I guess. I'm not sure if it's ever been available in other countries, but if you are in Thailand, you should give it a try. I just returned from Thailand. I am suffering from withdrawal over those corn pies. They were so good. I am befuddled as to why they won't sell them here. I also really enjoyed their rice porridge with chicken. first thing I'm going for when I return! !